It took us all of three years, but on a recent Monday night, we did it. We made it up to Yountville for Ad Hoc’s fabled fried chicken night. Since opening its doors in 2006, Ad Hoc’s simple, family-style, four-course, $49 per person set-menu has drawn raves, particularly for a few specific dishes. Sure, there’s the sous vide-cooked short ribs that are otherworldly tender. There’s the first-course salad, made with greens grown across the street at the French Laundry garden, that’s blessed with a sweet-from-the-earth flavor you’ll never forget. Then, there is the fried chicken. When fried chicken is done by Chef Thomas Keller, you expect it to be something special. The tricky part is that it’s not always available. Indeed, the fried chicken is on the nightly menu only every other Monday. In other words, your chances of trying it are only twice a month. And when it’s available, people turn out in droves for it. I admit that I try not to give into fried chicken for the same reasons most diet-conscious women do. But when you’re married to Meat Boy, who never met anything fried he didn’t want to inhale, well, so much for counting calories. He’d been waiting a long time to try this particular chicken. He’d even taken a day off of work to do it. He’d skipped one of his night classes, too. But I’m sure his instructor will cut him some slack. It’s fried chicken, after all. Dinner began with one of those amazing salads — whole hearts of romaine, strewn with shaved red onions, pickled radishes, spiced pecans and avocado wedges. 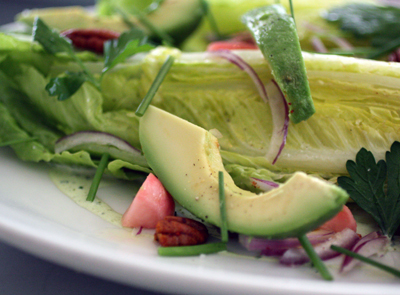 It was dressed with creamy green goddess dressing. Next, came the chicken — six pieces for just the two of us, piled high on a platter. The skin was battered with a rippling, mahogany crust. It audibly crunched as you took a bite. The flesh was so moist, juicy and tender, you barely had to chew. The chicken is brined overnight in salt, lemon, herbs, and honey. The next day, it’s dipped in buttermilk, then dredged in flour, and fried to perfection. Food & Wine magazine once featured the recipe for those who want to try recreating it at home. We’re talking some pretty dang good chicken. Whipped Yukon Gold potatoes made with at least a cube of butter accompanied it, along with red Russian kale from the French Laundry garden cooked with bits of house-smoked pork loin. 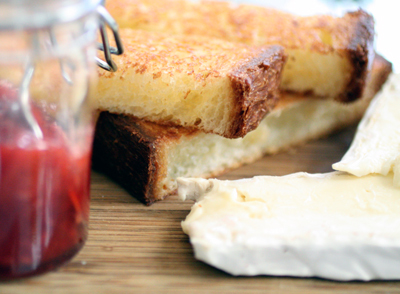 Slices of camembert with a tiny jar of mixed berry marmalade followed. The finale was light-as-air chocolate brownies with butterscotch sauce and pistachio whipped cream. Meat Boy and I were so stuffed that we had to box up two pieces of chicken to take home. Yet two 20-something gals next to us somehow managed to devour their entire platter of chicken, drawing admiring glances from a nearby table, whom we’re pretty sure included U.S. Speaker of the House Nancy Pelosi and her husband. Because when fried chicken is this fabulous, you shouldn’t ever be surprised at who turns up for it. Gosh, that crunchy skin…you won me over with that close-up, and I’m really not a big fan of fried chicken for the same diet-concious reasons as you! actually, I think that crispy skin is the best part…I used to only eat that part and give the flesh to my brother! I’m eagerly anticipating my reservation that’s in a few weeks. It won’t be chicken night, but I’m sure it’ll still be great. How do you get such nice pictures inside a restaurant? 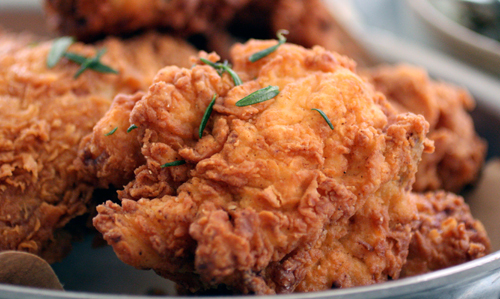 Ok, it’s 8:30am, and I am now seriously craving fried chicken! And, that salad sounds fantastic. OMG, everything looksf antastic and delicious! I love that fried chicken is so tempting! This is what my boyfriend and I ate when we were at Ad Hoc, well the fried chicken anyway. 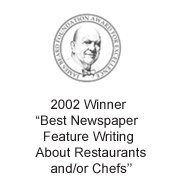 We made our reservation months in advance and were admittedly a little disapointed when we saw the actual menu, not knowing how good the chicken would be. By the time we finished our dinner we were converts. I typically don’t eat much chicken at all, but I was licking my plate clean. Thanks for bringing me back to what was a fantastic dinner. 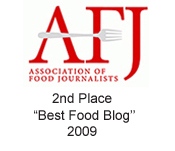 I’ve heard of those Thomas Keller fried chicken – they look fabulous! The rest of the meal sounds fantastic as well! I’ve been vegetarian for 10 years and the only thing that tempts me is fresh fried chicken. I would totally eat Thomas Keller’s fried chicken, no question. Now you got my mouth watering. Thanks for the recipe link! I moved away just before this place opened. That fried chicken looks incredible! I’ll have to make it a point to ensure my next trip back overlaps with one of those Mondays. Have to made it to ad hoc yet, not that any reason won’t do, but my goodness, just looking at that, I feel I have to get in my car and drive except I know that I won’t even get close to tasting that chicken – it looks stupendous and having had what I thought was the best fried chicken ever (grandma’s) I feel compelled to compare. It looks beautiful, too – the chicken and the salad both. 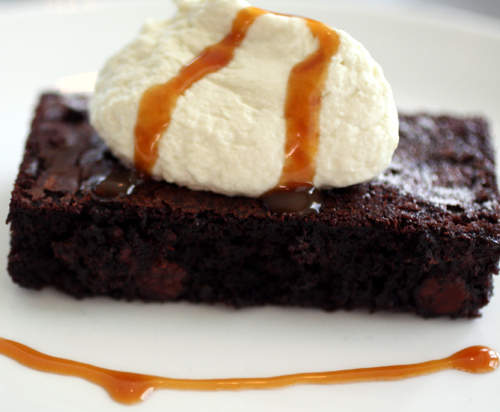 In addition to the chicken, that brownie with the butterscotch sauce looks awesome! Pistachio whipped cream, eh? I’ll have to try that. Sounds interesting! Anna: You make me laugh. You remind me of an old boyfriend who was vegetarian — except when it came to pepperoni pizza! But hey, we all have to have some vices. Otherwise, life wouldn’t be nearly so interesting. I love Ad Hoc’s fried chicken!!! 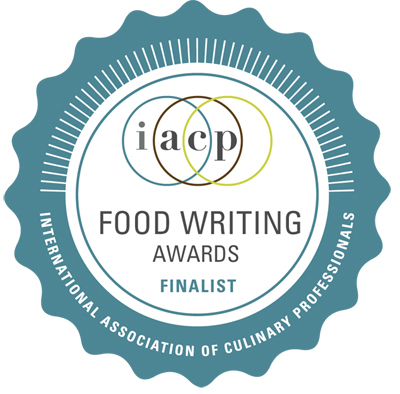 I love everything about Ad Hoc… their salads/greens are the best, desserts are fantastic and the ability to get seconds on any course is gluttonous! We’re going again next Saturday and I can’t wait! Oh wow. I want this entire meal. Every speck of it. Ah your description of the chicken was fabulous! Wish I could write about my food like that, but I’m learning lol Will definitely try out this recipe at home. I am DYING to try T.K.’s chicken. The last time I went up there, it wasn’t chicken day 🙁 but we had an unbelievable beef dish with roasted squash. And I’ll never forget how good the honey was in the cheese plate. Even though they had told me where to get some myself (a local farm), I still I wanted to smuggle that glass jar in my purse. I gained a couple pounds just reading your post. Wow! WOw, the skin looks amazing!